10 years. The time I stuck to the same brand of foundation. Admittedly between different types, but mainly one for more than half of that time. It worked (and still does) for me and as my skin is not the best skin around, I was really scared of changing, especially when I tried quite a few in the past and wasn’t very impressed with the results. However, I started thinking about changing when my current one seemed to oxidise a bit while on holidays. It seemed orangier and it bothered me a bit. Then I caved into a little 3-foundation sample from Hourglass. I had resisted mainly because of its price, an eye-watering £50 for 30ml. Thing it, I wish I hadn’t opened that package and slapped it on my face. From the three samples, Immaculate was my favourite. Although it is a light-medium coverage, it seem to cover just the right amount. At the same time, it looks natural and skin photographs amazingly. In fact, when walking in the streets and catching my face in mirrors and windows, it never looked more radiant. The Hourglass Immaculate Liquid Powder foundation is of a matte finish which is also quite powdery, which mean I am using much less powder; just a very light dusting to set it. The coverage is, as I mentioned before, surprisingly good, but the foundation feels extremely light on the skin and doesn’t create a mask; you can actually see your own skin. It is said to absorb oil, camouflage imperfections and last. I found it indeed does it all, and very well. It contains Cashmere Kaolinite Clay which is shown to absorb 75% of its weight in grease but does not dry the skin. I am not surprised I loved it as test have shown improvements to acneic skin over time, covering smoothness, scarring, pore sizes, dryness, oil production and breakouts. Honestly, I do think my skin is better overall, in texture and aspect. Of course, I wear fantastic products, so I’d say it could be partly to the foundation. I use it with their unbeatable Veil Primer which is seriously the best primer I’ve encountered in my life so far. If there is a downside, it’s the lack of sunscreen. You cannot have it all. Well, and the steep price. Again, this product is free from parabens, oils, fragrance, nanoparticles, phtalates, gluten, synthetic dyes and they do not test on animals or use animal derived products. Needless to say, at £50 is very expensive, but if you ask me, it is worth the money. There, I said it. 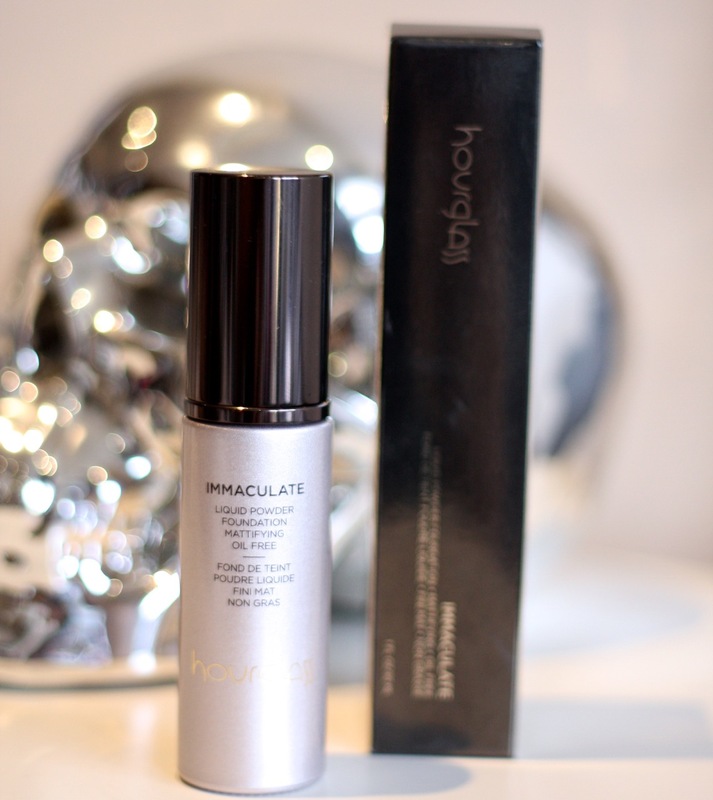 In the UK, you can find Hourglass products, including the Hourglass Immaculate Liquid Powder foundation in selected retailers, including my favourite Liberty, as well as Space NK, John Lewis, Net-a-Porter and others.